Across the holy lands of Bharath, countless beautiful temples exist for Shiva and Vishnu. Every nook and corner has shrines dedicated to these two gods, who have been praised tremendously in various scriptural works. However, it is a matter of concern that no temple is dedicated to the Creator, Brahma. It is a well known fact that this predicament arose because of Brahma’s lies to Shiva at the foot of the Arunachala hill. When Ayan and Hari were fighting over their superiority over each other, Haran appeared in the form of a glorious column of fire. The column knew no beginning and no end. It spewed heat and light and turned the dark night into a bright, hot day. Said Shiva, “He alone is superior, who finds either my foot or my head”. Vishnu immediately turned into Varaaha, the sacred boar, and started ploughing the earth in an attempt to get to the feet of the glowing torch. Brahma on the other hand, transformed into a swan to fly towards the head. But only in vain. Neither could locate the ends of the column of fire. While Vishnu admitted his failure, Brahma on the other hand brought down a Thazhampoo (Fragrant Screw Pine) and claimed that he had indeed seen the head and that the flower was from Shiva’s very crest. The flower too gave its false testimony to Shiva. Angered at the lies that Brahma had uttered, Shiva spat out a curse, “Oh Chaturmugha, for your base lies, may you not have any temple on earth. You deserve it not. And as for the Thazhampoo, it will never be used in my worship again.” Saying so, the flame turned into the famed Arunachala hills, at the foot of which is located the Annamalaiyar temple, Thiruvannamalai. And so, to this day, the Thazhampoo does not have a place in Shiva Pooja and neither does Brahma have a shrine on earth. No temple to the creator. Strange. However, it is equally strange that neither are there many temples dedicated to Saraswathi, Brahma’s better half. Though we worship her time and again, day over day, in the form of books and pens, of tools and weapons, there seems to be a dearth of temples for her too. “Indian Women share their husband’s plight. It is only natural that she does not have any temples as Brahma himself is left without one. Further, as the Mistress of Speech, she resides on the tongue of Brahma. That is her highest, most sacred temple. She is the perfect Pathivratha.” – An Explanation by his holiness, the Saint of Kanchi. However, there does exist one famed temple dedicated to Kalaivani, on the banks of the Arisalaar, a tributary of the Kaveri. The temple was built by a renowned Tamil poet of yore, Ottakoothar, and the town itself is named after him as Koothanur. Koothar was gifted this land by the Chozha kings, under whom he had served as the chief court poet. Kulothungan, Vikraman, Rajarajan II were all glorified by the presence of Ottakoothar in their court. It was on this land that he raised a temple to Vani, without whose grace he would never have been half as good a poet. However, the truth is that the land was indeed chosen by Saraswathi herself for the very purpose. It was a time when Dakshayini had been reborn to Parvatharajan as Parvathi. Having attained a suitable age for marriage, she of course chose to unite with her lord, Parameshwara. Intending to please Shiva with her severe tapas, she went into a forest filled with sacred Vilva trees and began her penance to gain Shiva’s hnd. The place known as Vilvavanam was soon blooming and blossoming with flowers and birds. Such was the benefit of Parvathi’s presence and her intense penance. Immensely pleased with Parvathi, Shiva decided to approach Parvatharajan and ask for her hand in marriage. However, there was one major flaw in the plan- Ganga. The second wife of Shiva, eternally sat in his matted locks, trickling down the Himalayas and flowing across the bosom of Bharatha. In the event that Parvatharajan came to know of this existence of another woman in Shiva’s life, it would be a very sticky situation indeed. Therefore, to avoid further disasters, Shiva turned Ganga into a young girl and himself into a Brahmin. He then handed over Ganga to Bhaskara Muni to take care of her while he supposedly went on a pilgrimage tour. Bhaskara Muni, who himself was involved in a penance to please Shiva, accepted the responsibility and took care of Ganga like his own daughter. One day, by the playings of fate, Bhaskara Muni went down to the Arisol Aaru (river) to do his daily ablutions. Having forgotten to bring his Kamandala with him, he shouted to Ganga, “Oh Daughter, can you please get me my Kamandala from the ashrama?” Ganga too obediently brought out the Kamandala to Bhaskara Muni. Suddenly, at that very moment, realizing her previous self, and to the utter surprise of Bhaskara Muni, Ganga joined into the Arisol Aaru, Bhaskara Muni was totally flabbergasted at the sight and could only blink in return. Things turned out to be more complicated, when Shiva returned back as the Brahmin and asked Bhaskara Muni for his daughter back. The Muni remained silent out of fear, not letting a word out. But when Shiva threatened him that he would complain to the King about this, things got really nasty and Bhaskara Muni narrated the unfortunate turn of events. He was trembling with the fright and the sheer shock of the sudden disappearance of a young lady. Not wanting to test his devotee any further, Shiva appeared before Bhaskara Muni in his true form and blessed him. The place where Ganga merged with the Arisol Aaru came to be known as Rudragangai. Since Gauri had performed her penance there, it is also known as Gaurivanam. Eons passed by, peaceful and quiet, until one day, at Brahma Loka a verbal battle broke out between Brahma and Vani. “It is because of me that Brahma Loka has attained so much popularity and fame”, argued Brahma. “No way dear, it is due to my presence that the flag of Brahma Loka flies high. 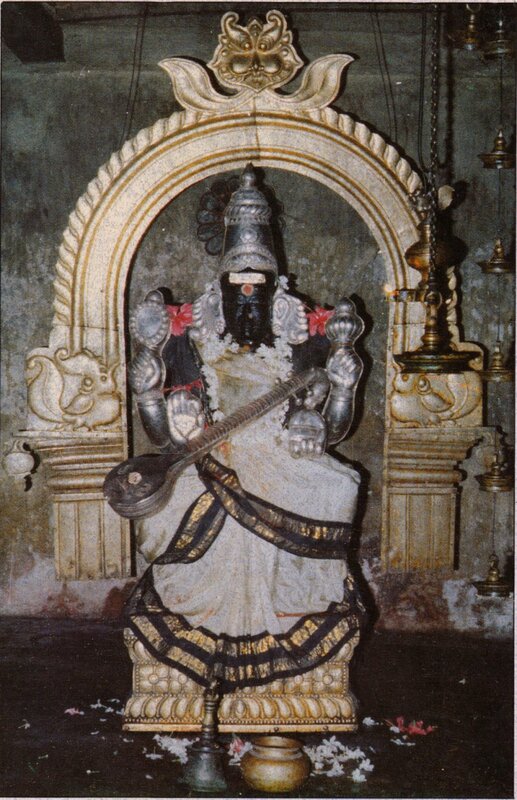 The moment I leave, the place loses its sheen”, defended Saraswathi. Quite soon, the tempers rose high and in a fit of rage, the cursed each other. As a result of the curse, they were born to a Brahmin named Punyakeerthi, as daughter and son. The son was named Bagukanthan and the daughter, Shraddhai. When they had attained a marriageable age, Punyakeerthi, as a responsible father, took efforts to find suitable matches. It was then that Brahma and Saraswathi realized their previous positions, and aghast at the complexity of the situation they prayed to Shiva to save them from this. Brahma too was relieved from the curse. “Mahadeva, it would be really great if you think over your previous curse of me not having any temple on earth”, he requested Shiva. “Brahma, though you will not have any temples on earth, in all Pitr Karmas you will be invocated with the Brahma Pooja. People will worship you this way”, offered Shiva and disappeared. And so Saraswathi went to the Rudragangai and merged herself with it. It is a different story that much later when Yamuna was suffering from the doshas of the people who bathed in her, Krishna suggested that she be relieved of them by bathing in the Rudragangai and meditating on Shiva. And so Yamuna too joined into the Rudragangai. With the confluence of Ganga, Yamuna and Saraswathi into the Arisol Aaru, the place came to be known as Dakshina Triveni Sangamam. It was on such a sacred spot that Koothar chose to build his temple for Sakalakalaavalli, the Mistress of all Arts. Located on the Mayiladuthurai-Thiruvarur route, near a village named Poonthottam, Koothanur is a small work of wonder. With a three-tiered gopuram, the humble temple is located by the Koothanur Agrahaaram. Outside the temple doors are shops selling white lotuses, coconuts and fruits – sacred offerings that are found outside any temple. However, at Koothanur alone, there are shops selling books, pens, pencils, slates and chalk pieces. Strange yet again. On entering the temple, we come across the Bali Peetam followed by a beautiful MukhaMandapam. During Navarathris and other festival days, the Mandapam echoes with the sounds of Vedas and chantings. Then comes the Artha Mandapam housing Vallabha Ganapathi, Brahma, Brahmapureeswarar and Bala Dandayuthapani. And finally, in the sanctum sits MahaSaraswathi, the glow of Knowledge emanating from her serene face. Clothed in white silk, with four hands, the upper two bearing the Akshara Mala and the Book of Knowledge (Palm Leaves), her lower left hand having an Amrutha Kalasha and her lower right in Chinmudra, her Veena, Kachapi, across her lap, with Jatamudi, the third eye of Knowledge and eyes full of grace, her very vision raises Goosebumps on our raw flesh. On the ninth day of Navarathri, pilgrims to this temple have the rare opportunity of offering worship to the goddess’s feet with their own hands. The priests make it appear that that the feet of the goddess, extend from the sanctum to the Arthamandapam, where people can personally touch and worship the feet with flowers and milk. On the tenth day of Vijayadasami, the temple wears a festive look with hundreds of people flocking to the shrine for the Aksharabhyasam/ Vidyarambham of their children. The priests smear the tongues of hundreds of tiny tots with sacred honey to form the shape of Pranava and give them the blessings of Saraswathi for a life brimming with knowledge and arts. The devotees buy the books, pens and other stationeries from the shops outside, keep them at the feet of the goddess and take them back home. It is believed that people who worship Mahasaraswathi during the Navarathri or the sacred Vaikasi Visakam day are bestowed with the ability to compose beautiful poems and Kavyas. As a fitting example to this stands Kavichakravarthi (The king of Poets) Kambar, the author of the famed Kamba Ramayana in Tamil. Kulothunga Chozhan was so impressed by the Ramayana that was written by Valmiki that he wanted it to be translated into Tamil so that the people of his nation could enjoy it too. He called together, two of the greatest poets of his time, Ottakoothar and Kambar and gave them this mammoth task of translating the epic. He also gave them enormous funds and materials for the same. Koothar immediately dived into the work and worked day and night, reading and re-reading, taking notes and composing on his own. Kambar on the other hand, being of a more playful nature, frolicked around the town, spending all the money. However, Kambar was an exceptional devotee of Saraswathi and he had complete faith in her. One day, Kulothunga called the poets to enquire about their progress. Koothar immediately launched into his compositions and sang out a few examples. He told the king that he was done until the part when the Vanaras prepare to build the bridge to Lanka. Everyone in the Court applauded him. Kambar on the other hand, had no idea of what the Ramayana was. But now, with Koothar’s explanation he had got hold of the general gist of the epic and steeled himself to play along. “Chozha Chakravarthi, I have done until the point where the Vanaras are already throwing the rocks into the sea to build the bridge”, he said. Kulothungan asked him to sing a few verses and Kambar, completely blessed with the grace of Saraswathi, composed a verse impromptu and sang it out. And that was Kambar’s proof. When he turned back to look at the woman, she had disappeared. Kambar immediately understood that it was Saraswathi herself and was overcome with ecstasy. Koothar too realized the divine play and accepting his defeat before Kambar, he threw his half composed work into the fire. Kambar however dived in and was able to rescue two of the Kandams out of the four that Koothar had composed. He added them to his own work which we now know as Kamba Ramayanam, an epic par excellence in Tamil. Such is the grace of the Goddess at Koothanur. As Goddess Saraswathi is for Learning, devotees can perform pooja in this temple to get excellent education and for learning fine arts. Musicians sing here and many even choose to perform here first. Instrumentalists have pooja performed for their instruments here. Apart from art and culture, Goddess Saraswathi also showers Her blessings for the education of children. Many parents see to it that the education of their wards begin on Vijayadasami Day, after the initiation ceremony at this temple. It is believed, that students appearing for Exams should write their Name and Roll number on a piece of paper and put it in the hundi kept in this temple after praying for success. Also there is a belief that couples who remain childless for a long time should offer ghee, which will be placed at the Feet of the Goddess and after performing pooja this ghee is given to the couple. On taking is ghee for the next 48 days, it is believed that the woman will certainly conceive. The temple buzzes with activity during Saraswathi Pooja and Vijayadashami. Apart from these Poojas are performed daily in the morning at 9.30 (Kalasandhi), evening at 6.30 (Sayarakshai) and in the night at 8.30 (Arthajamam). The other deities in the temple are Valampuri Vinayakar, Brahma, Nagaraja, Muruga, The Swan and Narthana Vinayakar, the last one being a self originated idol. The moolavigraham of Goddess Saraswathi enchants devotees, as she is the embodiment of kindness itself. Her expression is so serene and calm even as She is majestic. She is seated on a white lotus in Padmasana, adorned by a pure white silk saree, She has a book in Her lower left hand, Her lower right hand showing the chinmudra, Aksharamala in Her right upper hand, and Amrithakalasam in Her left upper hand. Both eyes are full of compassion. The third eye denotes Gnanasakshas . Her enigmatic smile captivates the minds of the devotees. Devotees can buy notebooks, pencils and pens, which are kept at the Devi's feet for blessings. It is believed that the students using these articles will get the blessings of Goddess Saraswathi. There are very few temples in India dedicated to Saraswathi, the Goddess of learning. Though we see Her in collaboration with other deities in most other temples, a shrine dedicated to the Goddess Herself is very rare. Located in the Mayiladuthurai-Tiruvarur rail route and one and a half kilometres away from the village Poonthottam is the temple dedicated to Saraswathi - Koothanur.